Book a stay at Glen Gordon Manor, an elegant inn surrounded by Virginia’s Blue Ridge Mountains. Chef/owner Dayn Smith helms Houndstooth, a restaurant that received Wine Spectator’s 2018 Award of Excellence and where Smith focuses on the bounty of the Shenandoah. Smith has bona fide chef cred: He has done stints in New York and Switzerland, has been featured on the TV show Great Chefs, and has participated in the invitation-only Culinary Olympics in Germany. Couples often book the Windsor Suite, which has a two-headed marble shower and a soaking tub overlooking a field where horses graze. The Epicurean Package—which includes a cooking lesson, winetasting, and five-course meal—starts at $550 a couple. Regular rates start at $169 a night. Glen Gordon Manor (1482 Zachary Taylor Hwy., Huntly; 540-636-6010) is about two hours from DC. Hide out in a tree house at Primland Resort, atop Virginia’s Blue Ridge Mountains. Cradled in the limbs of an ancient (unharmed) oak, the rustic Barn Owl Tree House is a cedar-paneled aerie overlooking the valley. The resort has three tree houses in all ($700 and up), each offering the most privacy and the best views of all the accommodations at Primland. Seclusion comes with a small price: You’ll have to get in your car—more of a challenge in snow—for a short drive to the lodge’s restaurants, spa, indoor pool, and observatory. Also inviting, and within walking distance of the lodge, are 16 rooms in the four chalet-style Pinnacle Cottages ($340 and up)—cozy havens with modern decor and sweeping views. Visiting in colder weather and don’t want to go outside at all to get to the resort’s dining and other amenities? Secreted within the lodge’s Observatory Tower is the glass-walled, semicircular Pinnacle Suite, designed for dreamy interludes ($1,000 and up). Primland Resort (2000 Busted Rock Rd., Meadows of Dan; 866-960-7746) is a five-to-six-hour drive from DC. Book Philadelphia’s Love Letter Train Tour ($23 per person), a guided 90-minute ride that rumbles by 50 rooftop murals painted by street artist Steve Powers. Each of his creations touches on some aspect of love, whether the bond between a couple or an artist’s affection for his city. Bunk at the Logan hotel (1 Logan Sq. ; 215-963-1500; rooms from about $200), which boasts its own collection of locally produced art and is within walking distance to Philly’s art museums—the Barnes Foundation, Rodin Museum, and Philadelphia Museum of Art—as well as the city’s famous “Love” sculpture. Philadelphia is a three-hour drive or a two-hour train ride from DC. Want something intimate? Head to Frederick and dine at Volt. 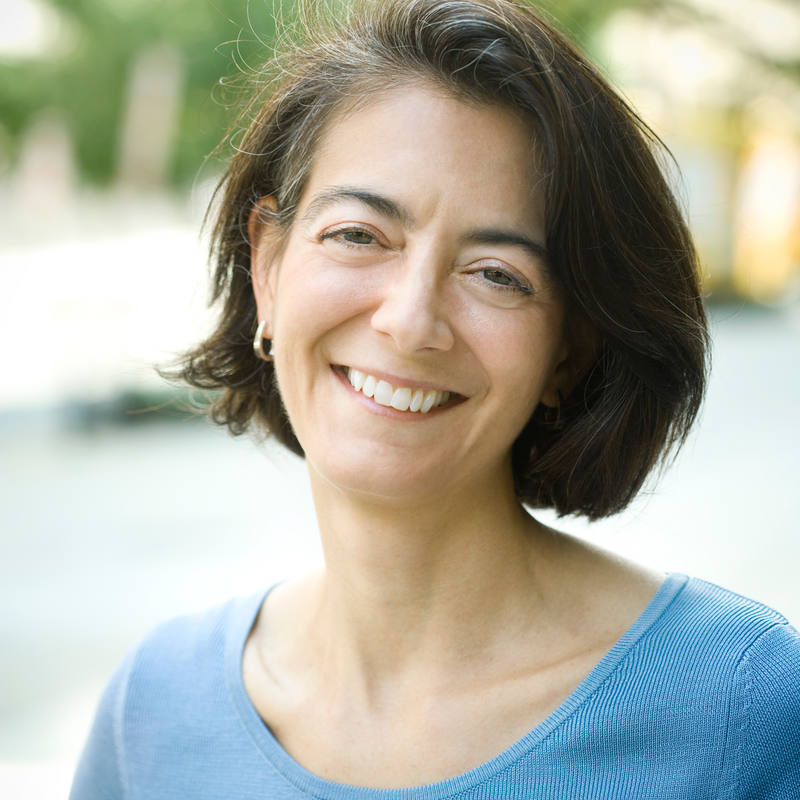 Photograph of Macaron by Scott Suchman. Transport yourself to a bygone era with a classic silent movie at the Weinberg Center for the Arts, a restored Art Deco film palace in downtown Frederick. Musical accompaniment to films such as The Passion of Joan of Arc (1928) and Pandora’s Box (1929) comes from a mighty Wurlitzer organ, installed when the theater opened in 1926. Afterward, try to spot the green dinosaur mural or the iron bridge decorated with sculpted dragonflies and flowering vines as part of the self-guided Downtown Frederick Public Art Trail. 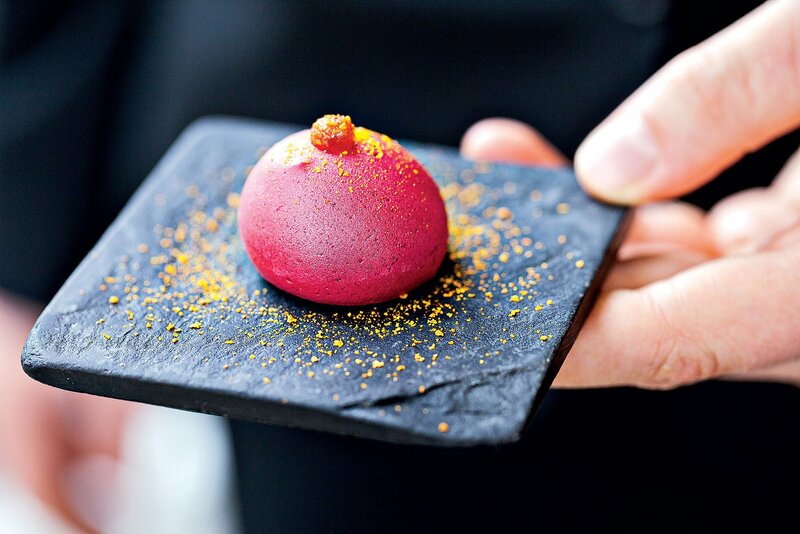 You can walk to dinner at celebrity chef Bryan Voltaggio’s sumptuous Volt restaurant, which serves deconstructed New American cuisine. (The ten-course tasting menu is $125 a person.) End the evening with a glass of Pinot Noir and fresh-baked cookies at 10 Clarke bed-and-breakfast, a landmarked Victorian that’s a short stroll away (10 Clarke Pl. ; 301-660-6707; rooms begin at $155 a night). Downtown Frederick is about a one-hour drive from DC. Relax in the Southern charm and opulent surroundings of Richmond’s Jefferson Hotel, with its stained-glass skylight and a grand staircase believed to be the inspiration for the one in Gone With the Wind. The Romance Package, offered year-round, will have you sipping sparkling wine while enjoying free valet parking and fresh flowers (101 W. Franklin St.; 888-918-1895; rooms start at $275 a night, Romance Package at $415). Don’t miss the Virginia Museum of History & Culture, where the current “Fresh Paint” exhibit of murals intertwines Richmond history with street art (through April 21). Later, slip into something fab and head to the hotel’s stately Lemaire for a three-course fine-dining experience. Sleep in and top off your stay with a hot breakfast in bed the next morning, also included in the Romance Package. Richmond is a two-hour drive from DC. 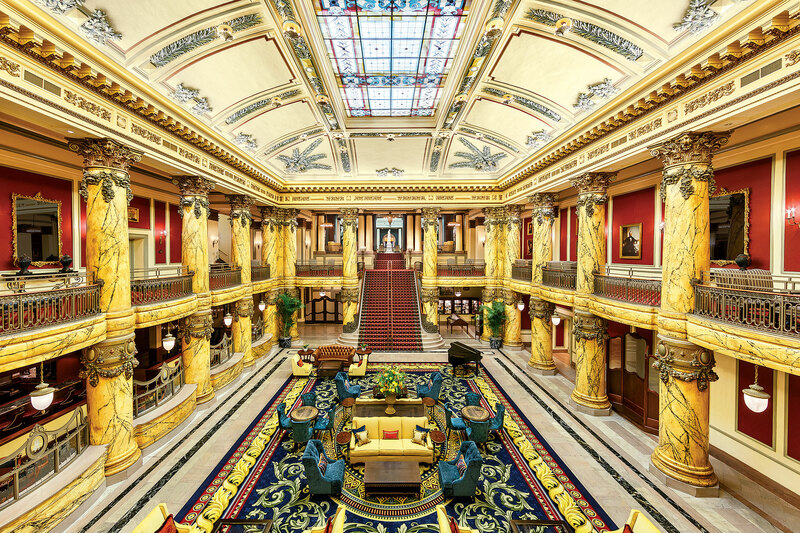 Sip Champagne in the grand lobby of Jefferson Hotel in Richmond. Photograph courtesy of The Jefferson Hotel. Salamander Resort & Spa in Middleburg offers Saturday-afternoon cooking classes ($79 a person). Chefs from its Harrimans grill lead interactive lessons with rotating themes, such as how to roll sushi, shuck an oyster, or smoke meat. Of course, you get to sample whatever you whip up. Later, you can stroll the boutique-lined streets of downtown Middleburg. For those who choose to stay overnight at Salamander, rooms start at $405. Don’t miss the soothing spa, where you can book an expert massage. Salamander Resort & Spa (500 N. Pendleton St.; 844-303-2723) is a one-hour drive from DC. What could be more decadent than checking into a local hotel with your significant other? High-thread-count sheets. Room service. No chores. No kids. This area has plenty of staycation-worthy hotels. One longtime favorite is the hip W Washington DC (515 15th St., NW; 202-661-2400), with its panoramic rooftop bar, POV, and a Bliss Spa. Two classy hotels where you also needn’t go far for a terrific meal: the Jefferson (1200 16th St., NW; 202-448-2300)—home to Michelin-starred Plume restaurant as well as a stylish bar, Quill—and the Park Hyatt (1201 24th St., NW; 202-789-1234), which houses its own Michelin-starred dining room, Blue Duck Tavern, as well as the stellar Tea Cellar. Or escape to Old Town—after all, when’s the last time you strolled the historic streets like a tourist? The Kimpton Lorien Hotel & Spa (1600 King St., Alexandria; 703-894-3434) puts you within walking distance of everything. Plus it has a spa and is pet-friendly. Spend your preflight night at Kent Island’s Inn at Chesapeake Bay Beach Club (180 Pier 1 Rd., Stevensville; 410-604-5900; rooms from $199), a ten-minute drive from the meetup spot. Kent Island is about a one-hour drive from DC. Ensconce yourself in a room named for some of literature’s most famous lovers—Elizabeth and Darcy from Pride and Prejudice, Jane and Rochester from Jane Eyre. That’s the theme of Inn BoonsBoro, owned by author Nora Roberts, who has penned almost 200 romance novels and been in the number-one spot on the New York Times bestseller list almost 200 times. Fans know that Boonsboro, Maryland, where the property is located, inspired the Inn BoonsBoro trilogy and is where fictional characters Clare, Avery, and the Montgomery brothers lived and loved. Inn BoonsBoro (1 N. Main St.; 301-432-1188) is about a 90-minute drive from DC. Rooms start at $235 a night and go up to $315, with additional costs for special packages. Salamander Resort in Middleburg (left) tempts with an elegant spa, while the Jefferson in DC houses one of the area’s most romantic restaurants, the Michelin-starred Plume. Photographs courtesy of Salamander Resort and Plume at The Jefferson. Relax in front of your own fireplace in one of the sleek and roomy waterfront suites at the luxe Inn at Perry Cabin by Belmond. Sure, the inn is within walking distance of the quaint Eastern Shore town of St. Michaels, but you may never want to leave your room, which was kitted out by celebrity designer Alexandra Champalimaud. At Stars, the ho-tel restaurant, book a table in front of the wrap-around windows overlooking Maryland’s Miles River, and sample local oysters and rockfish. At the charming spa, reserve a couples room for well-priced treatments (starting at $290 for two 50-minute massages). The Inn at Perry Cabin by Belmond (308 Watkins Ln. ; 410-745-2200) is an hour and 15 minutes from DC. Waterfront suites start at $470. Hit the Virginia Oyster Trail, a patchwork of restaurants, aquaculture farms, art venues, and points of interest all related to nature’s aphrodisiac. Although the trail runs throughout the state, numerous sites can be found along Virginia’s Northern Neck, including Dog & Oyster Vineyard (170 White Fences Dr., Irvington; 800-438-9463), which pairs its wines with local oysters, and Little Wicomico Oyster Co. (309 Railway Rd., Heathsville; 804-436-5962), a fourth-generation oyster farm that, weather permitting, offers tours and tastings of its crop. Merroir Tasting Room (784 Locklies Creek Rd., Topping; 804-758-2871), just across the Rappahannock River, serves oysters raw, roasted, baked, or barbecued. Spend the night in Irvington—about a three-hour drive from DC—at the always-romantic Hope & Glory Inn(65 Tavern Rd. ; 804-438-6053; rooms from $200 a night). For an intimate adventure, you can snuggle under wool blankets in a horse-drawn sleigh at Autumn Breeze Farms in West Virginia. You’ll glide over snow-covered country roads in an antique sled and warm up with mugs of hot chocolate back at the barn ($30 a person). Autumn Breeze also offers popular hourlong trail rides on horseback through a spruce forest ($45). Stay at nearby Snowshoe Mountain Resort (10 Snowshoe Dr., Snowshoe; 877-441-4386), where you’ll find dozens of downhill ski slopes plus opportunities for snowtubing and snowmobiling. Snowshoe is about five hours from Washington. 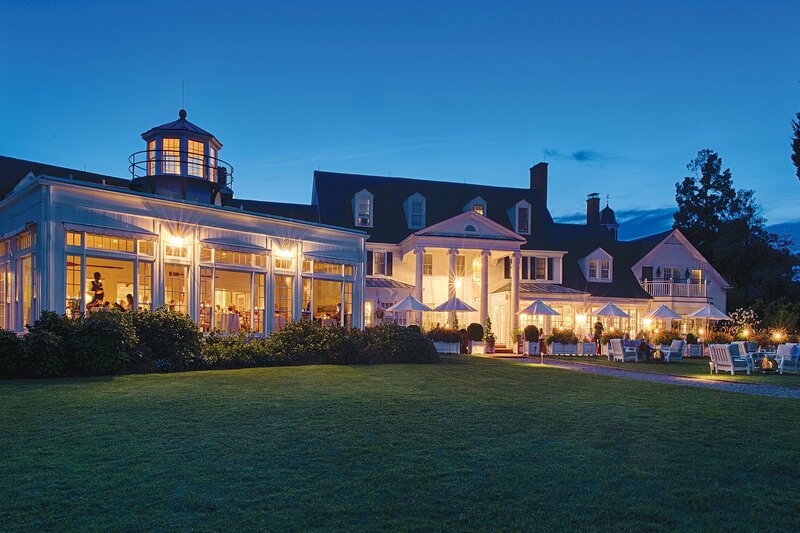 The Inn at Perry Cabin, on Maryland’s Eastern Shore, offers stylish suites with fireplaces and water views. Photograph Courtesy of Inn at Perry Cabin by Belmond.